Every year thousands of video geeks and retailers gather in Las Vegas. The geeks (us) are searching for ways to improve the way we work, and the retailers (they) think they have it. 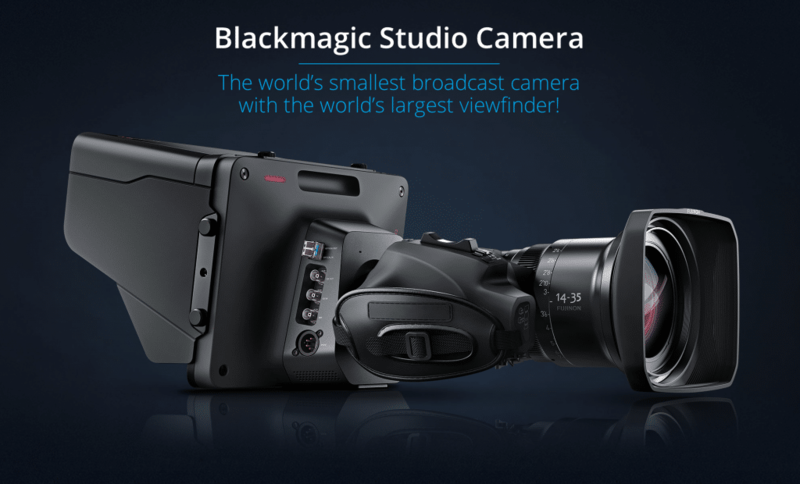 This is year I’m putting money on Blackmagic Design. Just this morning I received a lovely email detailing all the updates to their product line. Here’s what we’re excited about. In 2014 we’ve started several live production projects. This means that every time we shoot we have 2-4 rented cameras at somewhere around 200-300 a pop. That adds up and at some point you have to decide if you like the lack of liability in renting, or if you’d rather save time and money over a few years and own the gear. For us this is the decision we’re currently facing and the Studio Camera makes a compelling argument to buy. Not to mention that the Studio Camera blows the Sony EX1 and Canon XLH1 (which we rent) out of the water, theoretically.There’s only three issues I see with this camera right away. First, if you want redundancy then you’ll have to get an external recorder for every Studio Camera, since it doesn’t have built in recording. This isn’t that big of a deal since you can pick up the Blackmagic Hyperdeck Shuttle and a few SSD hard drives (250GB, 500GB, 1TB, where the 1TB drive should cover a day of conference talks easily). The second issue, and this is a doozy, is the untested and half-baked nature of Blackmagic releases. While they have shown us they can make killer products at killer prices, they’ve also shown that their releases can be… hectic. The third thing is that this doesn’t come with a lens. This is good and bad. I’m not stuck with some unchangable kit lens, but not I also need to pick up another lens. The upside is that I can use my Canon lenses I already have and use it as an excuse to get more =)Also a huge plus is that these have a LANC controller input so the start/stop/iris/shutter can all be controlled remotely. This means we only need to hire operators because all the fine control can be done from the switcher. BMD has also mentioned that you will be able to use Resolve live on these cameras, through the ATEM switcher software, to bake a grade into the camera! LANC control for remote start/stop, iris/focus! All glassy eyed, I have to say this is the camera the DSLR generation has been waiting for. The features of an ENG style camcorder, the technology we expect with DSLR, the high quality formats we want, at a price that isn’t stupid. The separate stations is nice since we often run a three person crew and end up crowded around a DSLR. That monitor also sounds fantastic compared to the typical 4-6″ monitors we work with now. It does seem a little odd to attach an iPad sized screen to the side of the camera but I’m sure it’s great. The fact that the sensor is upgradable makes this something we’ve never seen before. Sure the RED Epic/Scarlets could be upgraded to the Dragon sensor but you had to send that in and it doubled the cost of the camera. When a new sensor comes out for one of these URSAs you can do the swap yourself. Also the RAW (yay!) is recording at 12-bit 4:2:2. RED records 16-bit RAW but is also three times the cost. The last interesting bit is that similar to the Studio Camera, the URSA has a LANC input for remote control of start/stop, iris/focus. 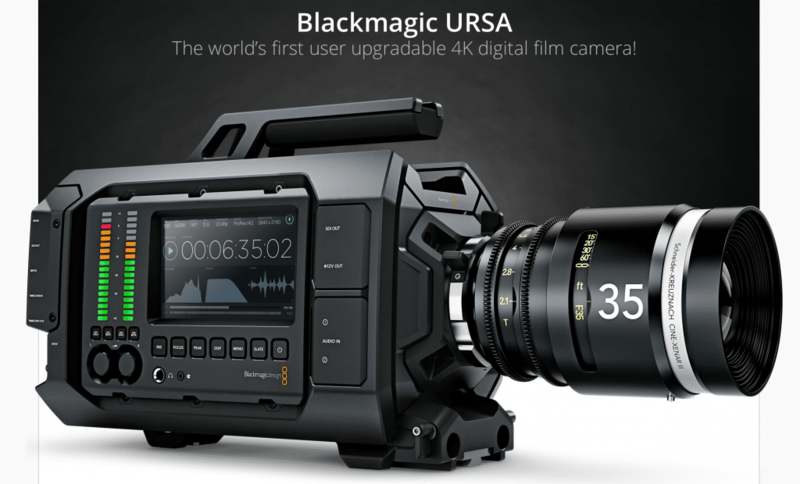 This means the URSA could be used alongside the Studio Cameras in a live production! We’re very excited about these new cameras at Backflip Films. These cameras look like the next step for any DSLR shooter. Perhaps after a little sleep we’ll see things differently. Until then, who’s buying what?